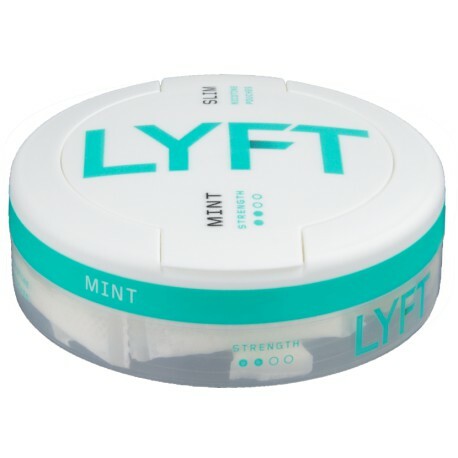 LYFT Mint Slim All White portions are flavorful nicotine portions without tobacco. The portions are made of fiber from eucalyptus and pine, with an added nicotine extract tobacco. Pamper yourself with the experience of the full sweetness of spearmint perfectly combined with the chilly freshness of menthol. I, Moe Unz, give up trying to understand these flavor descriptions. Yes, I understand they are tobacco-free (except for the nicotine extract). But "pamper yourself"? Really? Should I make a hot bath and light candles? That is not appropriate for mint snus. Just try it for yourself. It is like EPOK Mint but LYFT has a pleasant burn sadly missing in EPOK. This is a regular strength nicotine product, BTW.